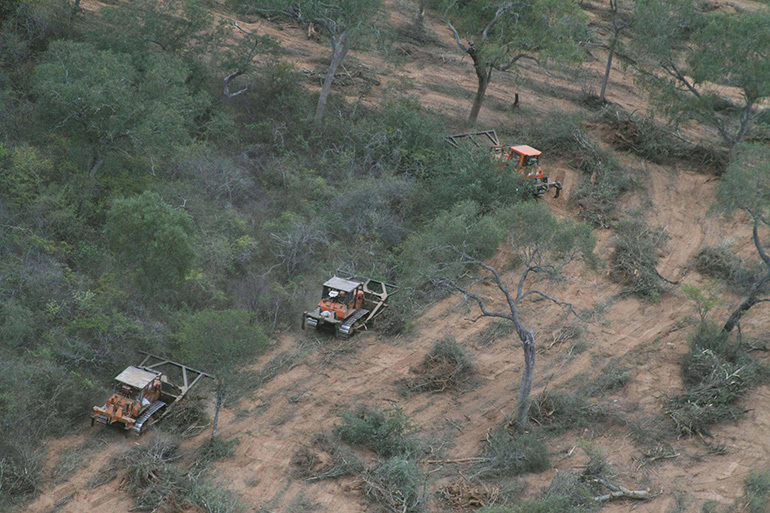 The nature reserve Arcadia, though created by decree of the president of Paraguay, Fernando Lugo, might be destroyed at any time by bulldozers. In 2012, Lugo was ousted by a coup organized by the Congress Parliamentary manipulated by the oligarchy. So, a few powerful landowners supported by multinational agribusiness companies have been awarded the agricultural frontier and are taking over natural resources. A new movie in the Chaco makes sense not only because Arcadia, though vulnerable, is a reality, also because many young Paraguayans have offered their cooperation and commitment to sustain this natural reserve. They see in Arcadia a symbol of resistance. They want this forest to be protected by law, by ideas and sustainable projects in co-management with the Guarani community. These assumptions lead to a collision with the current political establishment, with the corruption of the judicial system and to recognize what is the power behind the power in the democratic Paraguay. The dark side of this new conquest settles in the Chaco and Arcadia is right in the heart of the Chaco. Due to the current model of agricultural production, Paraguay has become the fourth largest exporter of soybeans, in just ten years. The same model is being developed in the other side of the border, in the Oriente Boliviano, eastern Bolivia. Both productive models launder illicit capital and both will converge on the Trans-Chaco route linking Santa Cruz to Asunción, which will globalize production.There is an international drug business and money laundering through agribusiness that is destabilizing the region and would be in a position to transform 22 million hectares in productive land, an area equivalent more than a third of the size of France. Obviously the expansion of the agricultural frontier will not guarantee food security for the people of these regions and instead will cause the disappearance of ancient and complex social structures, and devastate an environment undiscovered. The story unfolds in a mysterious land, situated in one of the last frontiers between civilization and nature, the Paraguayan Chaco. It is the ancestral territory of various indigenous communities, including the Ayoreos living in voluntary isolation, avoiding all contact with the settlers. The Chaco is hostile, inhospitable, far from everything but the desire for conquest and wealth. There is fever triggered by the possession of the land. This project is connected to the last movie we made, The Impenetrable, where we tell the story of a legacy: 5,000 hectares of virgin forest in the heart of the Chaco. The Impenetrable is a western documentary. During its shooting the thread that guided us was the need to return those land to the Earth, to its indigenous people, the Guarani Ñandevas. A goal that was fading while filming progressed, to prove an impossible dream. The reality forced the protagonist, Daniele Incalcaterra, to change course. To save these 5,000 hectares of deforestation, he had to create a nature reserve in perpetuity that called Arcadia. The new movie project takes its name, Arcadia, intending to tell through the vicissitudes of the protagonist to ensure the natural reserve, what interests threaten its existence. They are the same interests that are deciding, far from prying eyes and ears, if the virgin forest of the Chaco, second only to the Amazon, may exist in the future. Arcadia is a « thriller documentary film ». Also this time a dream: the protagonist, Daniele Incalcaterra, will be killed in the Chaco during filming. When he gets there, his reputation precedes him. Incalcaterra is no longer a lost and uninformed foreigner striving to find the location of his land in the Impenetrable. Arcadia has become an uncomfortable reality that many fear will become a symbol of resistance. So Incalcaterra has been declared persona non grata in the Chaco. For more than a year he has been intruding and sticking his nose where occult powers would want to conduct their business in silence, with the utmost discretion, in an almost uninhabited territory where the State is absent. The film, while still maintaining the codes of a documentary, will be like a thriller. The writing is interwoven with constructed scenes to highlight the dangers that the protagonist has to face, the obstacles that he must overcome, intrigue and hidden issues that are played behind him. We must remember that in the Chaco Incalcaterra is persona non grata. It will be impossible to film face to face with some characters. Hence, the option of using the mise en scene. In the film the actions and words will be filmed at the time they arise, without repeating the scenes. However, dialogue guidelines will be developed during preparation of the film to optimize interventions and actions of the protagonist. Then dialogue will develop freely during filming.